Soul Shots, a portfolio of 16 political cartoons that first ran in The Daily World between 1969-1972, and were then published in portfolio format in honor of Harrington's 60th birthday. Each image provides a link to the next image. Where they exist, captions are given below the image. Born in Harlem, in 1912, Oliver (Ollie) Wendell Harrington discovered his love of drawing and social conscience at an early age. By his mid-20s he had created the single-panel cartoon strip titled Dark Laughter, which was a showcase for social satire from the perspective of its central character, Bootsie, an Everyman described by Elton Fax (in the forward to Soul Shots) as an "outlandish and folksy Harlemite. "Dark Laughter and Bootsie appeared in the Afro-American press from the mid-1930s to the 1960s. In the 1940s, Harrington was a correspondent for the Pittsburgh Courier; first he visited stateside military bases and later he was sent to North Africa and Europe. He reported on the contributions blacks were making in the war effort; his stories and images transmitted the perspective of the black soldier in the segregated armed services. By the 1950s, he had become an expatriot, in part due to the repressive political climate engendered by the McCarthy investigations. Living in Paris (1951-1961) his circle included other American expatriots; author Richard Wright and Harrington became especially close friends. His work continued to appear in the press, both here and abroad. 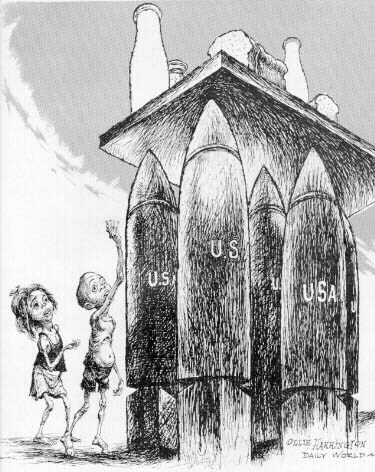 By 1968, Harrington's political cartoons were appearing in the American weekly, The Daily World (formerly The People's World) and in European publications as well. His themes, both in cartoons and essays, remained focussed on institutionalized racism and the skewed distribution of political and economic power, made manifest in war and poverty. He moved to what became East Berlin shortly after his arrival in 1961, and he continued to live and work there until his death in 1995. Harrington's books include biographic information, essays and ample illustrations of his work.